I love the Immortal Instrument books but this one was ehh…..
By now we all know the back story…it’s a little bit Harry Potter, a little Star Wars, a little LOtR, a little bit country and a little bit rock n’ roll, with some kitchen sink and a lot of a little things all meshed together. Up to this point I DON’T CARE. I really don’t doesn’t bother me in the slightest. 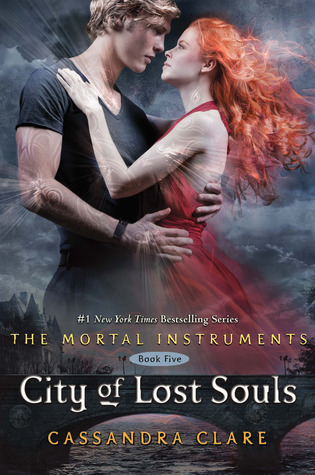 This book picks up right after Jace goes missing…with Sebastian. The Clave searchs for him for what feels like 2 days…no sign. Oh well they give up and concetrate on other issues. Clary and gang refuse to give up. That is right. You guessed it. Anyway, Jace comes to get Clary– she goes. She finds out she can’t kill Sebbie because it would kill Jace. Yep they are like bros from different hos and can’t be separated. Clary has sexual tension with Jace. Has unintended sexual tension with Sebastian. La da dee dee da. Some demons are summoned. An angel too. Awesome..kinda. I’m going to be honest. I’m not a huge Clary fan. I LOVE JACE. That’s it. That is why I am still here (and will read the next one…ugh). The last 30%? of the book was full of action and went by fast. The parts without Jace were pretty blah. He is literally the only person in this universe that has a sense of humor. The first 50%, 60% hell 70% dragged… “oh no Jace is gone” “oh no Jace is working with Sebbie” “oh no this isn’t my Jace” “oh no Jace and I took faerie drugs and almost ‘did it’ in a club”. I was like Oh, no, Jace is hardly in this book! Why do authors seem to think they need to neuter or kill their best characters? I feel like he is being phased out like Ren in the Nightshade series. I know that is not what is really happening. I think Ms. Clare just can’t think of many more one liners so she has to make him a shell of himself. His one liners must be like JK Rowlings quiddich. Awesome for the fans but hard to make new and refreshing. Don’t get me wrong there are glimpses of Jace in his glory. But they felt few and far between.